Well, I had intended to use this weekend to finally update the blog on "December 2009", as Evs had a bit of a rough-patch there - but this now finds me writing yet again from her bedside in a hospital room, so the rough-patch has not quite left us behind with the rest of 2009! In very brief, in December, Evs had 2 stays at The Scottish Ritz for respiratory difficulty. We think it all started with a rough seizure, that lead to several administrations (in consult with Neurology, of course) of Ativan & Diastat (her PRN seizure medications). Those are both strong sedatives, and it's not uncommon for her to have a "floppy" airway afterwards - but the multiple administrations stacked-up to really give her a challenge with moving air, and so we ended up in the ER and then were admitted for the night. We were discharged late the next day, as she seemed to be moving air quite a bit better, but with some new equipment to add to our arsenal - a nebulizer and associated medications (Albuterol & Pulmicort), a suction machine & a pulse-ox monitor. Over the next 4 days, she "wobbled" a little, seeming to be getting a little better - we suctioned, nebulized, and monitored tirelessly (or rather - in spite of being tired), but eventually we had to bring her back in, as she was really struggling with moving air again - just "junky", congested, and wheezing; in spite of all our treatments. This time she was diagnosed with bronchiolitis; essentially, she seems to've just picked up a "wintertime bug" (perhaps at her first stay in the hospital), but since she is less mobile & has lower muscle tone - it's all just a little more difficult for her, to cough things up & the like. We spent about 6 nights on that stay, and came home with her on a slow-but-sure uptrend. We added oxygen and a cough-assist to our equipment inventory at home, and started Evs in consult with a pulmonologist (coincidentally, the father of a classmate of my brother's from West Point). Evs weathered Christmas & New Year's pretty well - she had a few up days & down days, but all-in-all seemed to be continuing the rough upward trend - she was looking perkier, acting happier, not needing oxygen, and just generally seeming "better". However, once New Year's was over (I mean, literally - an hour-and-a-half past the end of 1-Jan), she started to have some more difficulty. We put her to bed Friday 1-Jan with a little bit of oxygen (0.5-1L), since she seemed to be breathing a little fast, but not of tremendous concern. Then at 1:30AM on 2-Jan, her heart-rate really started staying above the "normal" limits (~150bpm) - whenever she's seemed to be anything but "breathing easy" over the past weeks (when we've been at home! ), we've kept her on the pulse-ox monitor - which also measures heart-rate, in addition to oxygenation - so it alarmed & woke us up. Over the next 1.5 hours, we took her temperature, which was feverish (101-103), and her heart-rate continued to rise (160-170bpm). We continued to add oxygen (up to 2L), mainly to see if that would help her relax - her oxygenation was "okay" given the amount of O2 she was on - she was generally hovering ~94% or better (ideally, a "healthy" person would be pretty close to 100% when "awake", on "room air"). Given all that, though, we suited-up and brought her in to the hospital (ER) at 3AM (on the up-side, the ride down GA-400 was as smooth as it gets!). While in the ER, on the same amount of oxygen - her oxygenation really started to deteriorate (less than 90%), and continued to do so in spite of increased oxygen flow & breathing treatments (including heliox and magnesium sulfate, in addition to the usual suspects of Albuterol & Xopenex). A chest X-ray showed that she had some pneumonia, primarily in her right lung. So, those two things taken together got us promoted from the "regular" floor to the PICU, which is where I'm writing from now. After a long day there, Evs seems to be (crossing my fingers!) stabilizing some. This is our first bout with a pneumonia, and as we saw, they can move quickly, and also get worse before they get better. So far, they've had to keep her oxygen flow up pretty high, but we still have a step or two between where she's at and "rock bottom" in respiratory intervention (that being, intubation & ventilated), so that's hopeful. But - we shall see. In general, we knew that respiratory issues were a definite possibility, if not an eventuality for Evs - it's just kind of the expectation for anyone dealing with cerebral palsy-like symptoms (low mobility, low muscle tone, low coordination, etc), and it is certainly not at all uncommon amongst others afflicted with Aicardi Syndrome. 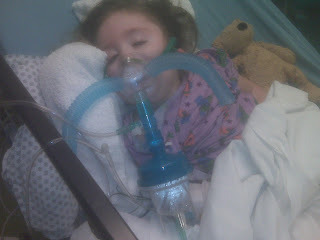 To those ends, we're thankful that Evs made it through her first 2.5 years without any appreciable respiratory issue. However, anticipated or not, it's certainly no fun to enter yet another new sub-discipline of medical management, and especially anything dealing with pneumonia. But - here we are, so on we go! Thanks so much for the thoughts & prayers - they are definitely helpful. Kim & I are both staying the night tonight, thanks to my folks watching Owen at our house overnight. We'll try & post a few updates along the way - but the main name of the game is "keep her oxygenation up and move it higher" - which comes by way of "clear lungs"!